Natural Pregnancy Stretch Marks Remedies - Get rid of stretch marks before they start and safely prevent stretch marks during pregnancy! More than 75% of all women get stretch marks during pregnancy! Whether you develop stretch marks depends upon a number of factors including rapidity of weight gain, age, genetics, the condition of your skin and your general health. You can naturally help prevent stretch marks during pregnancy with a natural pregnancy stretch mark remedy. It's natural, chemical-free and without the risk of side-effects! Avishi Organics Intensive Stretch Mark Oil activates skin renewal to visibly minimize the appearance of existing stretch marks and scars, as well as reduce the possibility of new marks forming during pregnancy. It is free from chemicals, fragrances, colors, parabens, sulfates and other toxic ingredients, and is safe for use during pregnancy and breastfeeding. Stretch marks (also known as striae) are extremely common and affect a vast majority of women during their pregnancy. They appear as raised red, pink, purple or dark brown lines or streaks in the skin. In the beginning, stretch marks are quite visible but over a period of time they fade into flat, silvery lines. 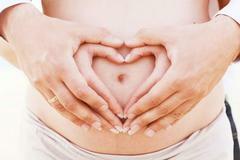 Stretch marks generally appear on a woman's belly during pregnancy from the end of the second trimester onwards. The abdomen expands quickly to accommodate the baby growing inside and as a result the skin is stretched on parts of the body where fat is stored. Women may also develop stretch marks on the breasts, thighs, hips, buttocks, upper arms and lower back. Over time (about 6 to 12 months) stretch marks do eventually fade and become less noticeable. This is because the pigmentation fades and lightens. In cases where the appearance of stretch marks is more severe, you may need to consult with a dermatologist where topical creams such as Retin-A and glycolic-acid may be prescribed. Keep in mind that these creams should not be used during pregnancy or nursing as they may cause some negative side effects. Cosmetic treatments such as laser treatments and microdermabrasion may also help to improve the appearance of stretch marks and restore the skin's elasticity. These treatments are however quite costly and can be harsh treatments on the skin, so consider whether you absolutely need to have them done. More and more women are choosing to use natural and holistic treatments during their pregnancy because they are gentle on the body and support healthy skin from the inside out. A variety of moisturizers, creams and oils containing natural ingredients are available to reduce and prevent the appearance of stretch marks. Simply massaging moisturizers into the skin daily helps increase circulation and promote the rejuvenation of the skin's layers. It is recommended that you gain no more than 25 to 35 pounds of weight. Gaining weight slowly will also minimize your risk of getting stretch marks.